A mysterious complex of temples, mounds, geometric forms, wareshouses and homes is now gone. Was it a fortified port, a religious shrine, a royal compound or all of the above? Look to the west from the edge of Downtown Savannah, GA and all you will see along the Savannah River are huge derricks, massive cargo ships and warehouses. A mysterious Native American complex on an island adjacent to the Savannah River no longer exists. The site was developed by the Georgia Ports Authority six decades ago. Few, if any, of the tourists from around the world who visit Savannah know much about its history prior to the arrival of English colonists in 1732. The coast of Georgia and South Carolina was where Spain focused its initial efforts to colonize North America in the mid-1500s. Prior to that time, the coastal islands and estuaries near Savannah were occupied by the Wahale People. The name means “Southerners” in the Hitchiti-Creek Indian language. Probably, the Wahale were from the Florida Peninsula originally. Having no “W” in their alphabet, the Spanish wrote their name down as the Guale. They appeared to the Spanish to be simple people, who lived in villages or hamlets, and only built small burial mounds of sand and shells. During the late 1500s virtually all of the Wahale became associated with a chain of missions along the coast of what are now Georgia and the southern tip of South Carolina. However, by 1732 the Wahale were essentially extinct . . . wiped out by waves of European diseases, the abuses of Spanish serfdom and finally repeated attacks by other Native American groups from the interior. A few hundred fled to the vicinity of Saint Augustine or among the Apalachee of the Florida Panhandle, when the Spanish abandoned the Georgia coast in 1684. Muskogean* villages, ethnically related to the Wahale, moved from the interior of the Coastal Plain to replace the Wahale after the survivors moved away. These peoples were known by the British as the Yamasee. The name means “offspring of Yama” in the Hitchiti-Creek language. Yama was a trade language associated with the area around Mobile, AL. However, in 1715 the Yamassee rebelled against the British because of their continued practice of Native American slaves. The Yamassee almost destroyed the South Carolina Colony until the “new boys on the block,” the Cherokees attacked the Yamassee from the rear and drove them down into Florida. A regional center for something? 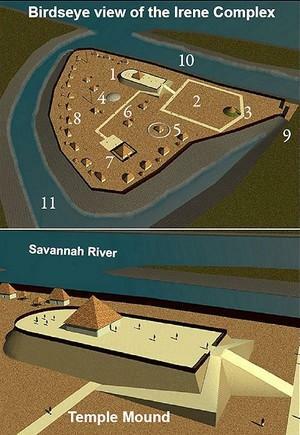 Around 1000 AD, some unidentified group began constructing a complex of buildings 21 one miles inland from the sea on a triangular island next to the Savannah River. It was a location that humans had camped on for thousands of years while fishing and hunting. Until roughly at this island, the Savannah River runs fast and clear. Tidal flows slow its movement beyond here. Of all the rivers in the Southeast, it drops from the Southern Highlands along the shortest horizontal distance. On one side of the island was the Savannah River, on another side a creek, and the other a ravine created by centuries of rainwater. It was a naturally fortified site for controlling river traffic. The newcomers augmented the defensive nature of the site with timber palisades. The settlers erected houses and the first stages of several mounds. Their houses were similar to those being built about 150 miles to the west on the Ocmulgee River. Although the Georgia coast in recent decades has never been directly hit by a major hurricane, the location of the Irene Complex would be a relatively safe haven for coastal trading canoes or even sea-going Maya merchant sailboats. Savannah was intentionally planted 16 miles inland in order to put distance between the city and hurricane tidal surges. The site also adjoins a major trade path that paralleled the river all the way from the mountains to the see. The architecture and plan of the complex at Irene continued to evolve through the centuries. While the houses were similar to those at Ocmulgee National Monument in Macon, GA the public architecture, though, became something very different than was found in most of North America at that time. (1) The largest mound is an elongated form that is semi-circular on one end and rectangular on the other. The rectangular end is served by three ramps. (2) An unusual type of pentagonal earthwork extended southward from the main mound. This type of pentagon is also found at Zoque (Olmec) cities in Mexico. (4) There was a dome shaped minor mound constructed of shells to the west of the main mound. .
(5) To the south of the shell mound was a temple surrounded by a shell ring. (6) Between the shell dome and the shell ring was a paved walkway that connected the large mound with a small plaza and a public building. (7) The public building at the end of the walkway was surrounded by a timber palisade. Was this inner palisade a visual screen or a barrier to protect the contents of the building? The building within a palisade has the appearance of a prison, but the timber palisade may have been meant to be a psychological barrier from the outside world . . . much like the walls around medieval monasteries. (8) Houses of substantial size were constructed around the west and north periphery of the island. (9) There was a fortified gate on the south apex of the triangle where a narrow land bridge joined the mainland. (10) An outer channel of the Savannah River provided the main entrance to the complex. (11) The inner harbor was probably where most canoes and boats landed to unload cargo. A “royal” compound where the leaders of the province and their retainers lived. The lack of large “capital” towns among the Wahale, might be explained by them being subject to the authority of whoever lived at the Irene Complex. A fortified port of entry where goods from the mountains and piedmont were traded with goods from the coast and Florida. The large building inside of an inner stockade, may have been a warehouse for especially valuable goods. A regional religious shrine where priests and retainers lived in a fortified environment to protect the site from raiders. A fortified port of entry that evolved into a major religious shrine and regional capital. The WPA hired famous archaeologist Joseph Caldwell, to supervise excavation of the Irene Site in the late 1930s and early 1940s. Caldwell’s work crew was almost completely composed of African-American women. These women did an outstanding job . . . especially considering that prior to going to work for the WPA none had any training in archaeology. The Irene Mounds Study is still considered one of the most accurate and thorough archaeological projects of the mid-20th century.